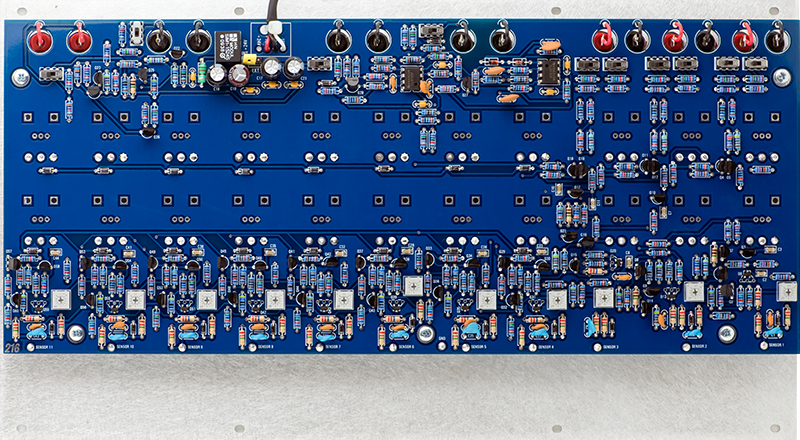 I built a Buchla 216 Touch Controlled Voltage Source module for someone else. They sent me a complete kit of parts and I assembled and tested the module. Many of the components are sourced through Mouser but specialized parts, panel, and knobs have specific sourcing and I do not know the details. 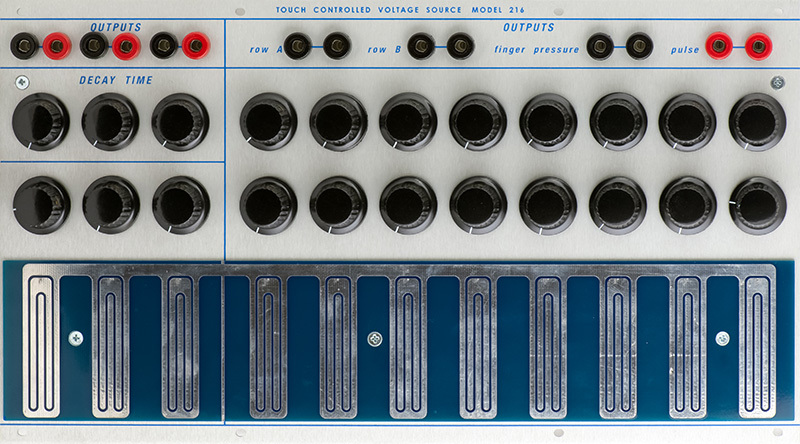 The front panel consists of 22 potentiometers and the touch panels. These potentiometers have only one pin soldered. I mount the panel then reflow the pin so the potentiometer relaxes without stress, then solder the other two pins. There was a bit of a bow in this PCB so the potentiometers in the middle sit a bit further off the PCB. There are quite a few components on the rear of the PCB. Construction was not difficult. I did countersink the three holes in the sensor PCB so I could use flat head screws. 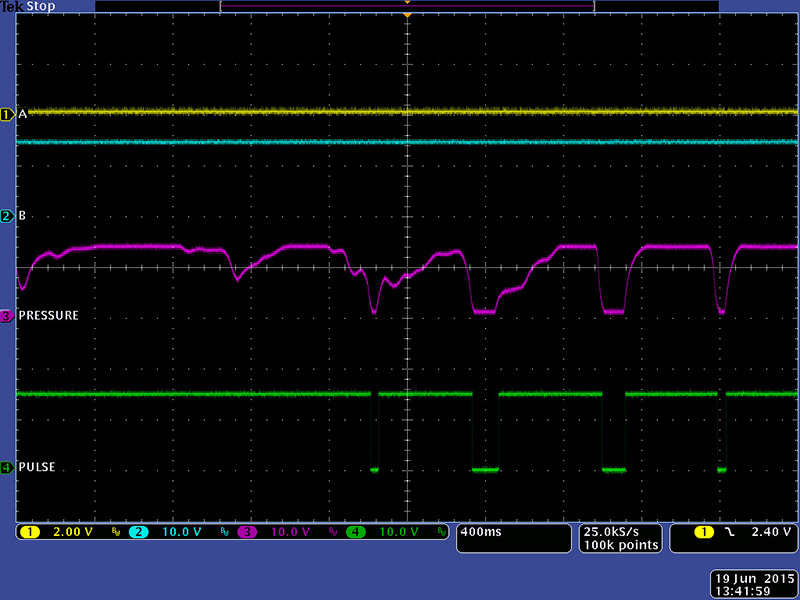 Calibration of sensors 1 - 3 is quite easy as you adjust the trimmers for 0V output. You set the voltage high and then decrease it until you reach 0 volts. Calibration of sensors 4 - 10 is critical because set too high the sensor will not release when the next sensor is pressed. I found that this unit worked perfectly with all the trimmers set to minimum. Trimming is actually difficult as the sensor and trimmer are on opposite sides so access to both is a challenge. I didn't understand the 216 operation when I first started and I was unable to find a manual. It is comprised of two separate sections. The first three touch sensors provide a voltage output with a variable baseline and decay time and a pulse (gate) output. This scope image shows three different decay times. 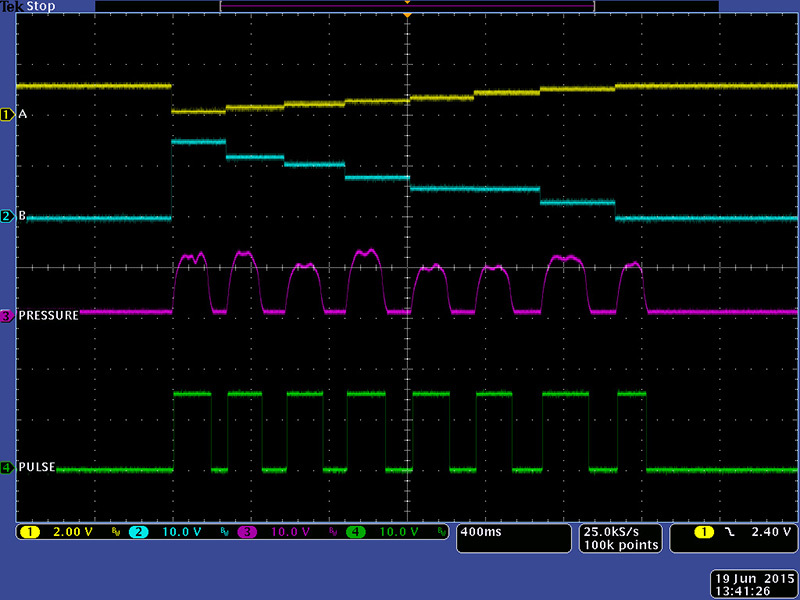 In this scope image I am adjusting the lower unmarked control which sets the baseline for the voltage output. After the decay I am adjusting the control to a higher baseline. 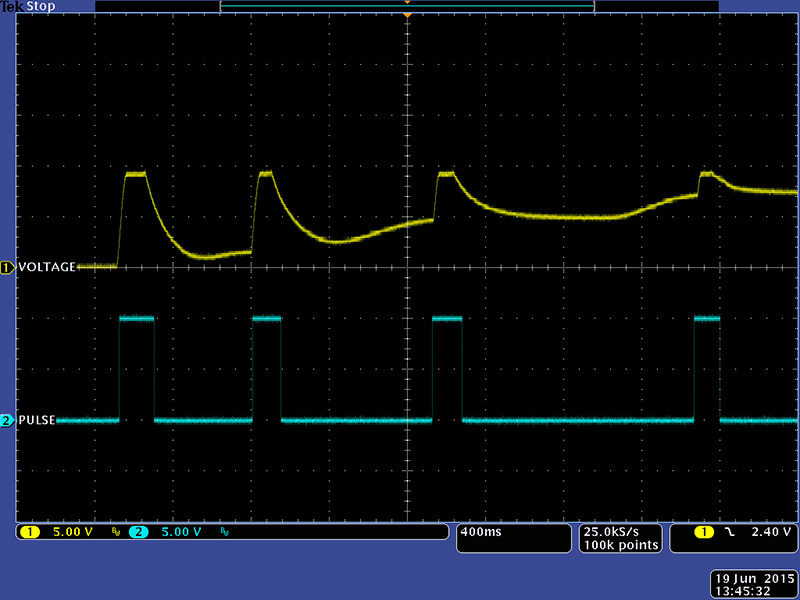 The voltage out amplitude is always the same. The second section is sensors 3 - 10 which provide a latched A voltage output, latched B voltage output, pressure, and pulse (gate). 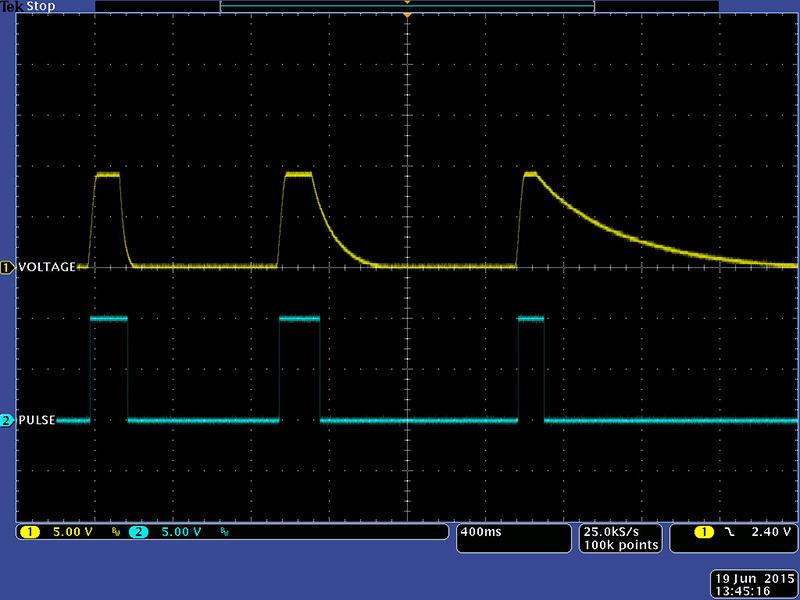 The top control sets the A output voltage and the bottom control sets the B output voltage. 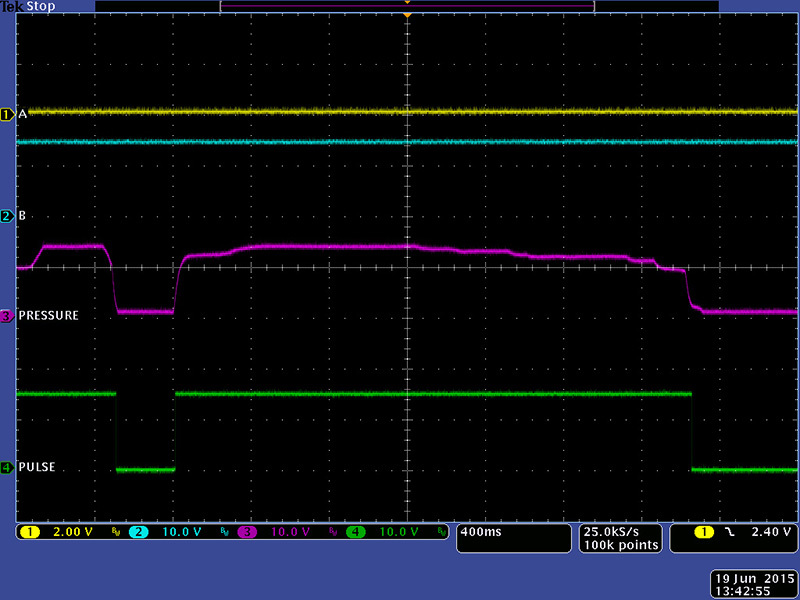 These voltages are held until the next sensor is pressed. This scope image shows a finger "slide" from sensor 3 to sensor 10. The A row is adjusted for 1V/Oct semitones. The pressure sensitivity has a very narrow range. I have not lacquered the sensors and that may make a difference. You can trigger the sensors with little pressure and full pressure but more difficult to get subtle variations in between. This scope image shows a small variation in pressure. When you release a sensor the pressure and pulse pulse outputs go false so it is easy to get multiple triggers with very light pressure as shown in this scope image.